Great End of School Gifts | Breezy Mama Breezy Mama - Expert parenting advice, celebrity interviews, product reviews for kids, moms and babies and more! Cute Idea Alert! Perfect for End-of-School! 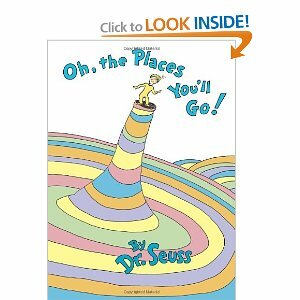 I’ve been known to give Dr. Seuss’s inspiring book, “Oh, the Places You’ll Go!” for a high school/college graduation gift, but Breezy Mama reader Linnea has a much better suggestion. When leaving a comment about her favorite Dr. Seuss book, Linnea wrote, “One cute idea I have picked up along the way is to have each of my kids’ teachers each year sign the Dr. Seuss book “Oh The Places You Will Go” so that hopefully when they graduate from high school they will have a book full of well wishes from all the people who helped them to get going.” LOVE this, and am planning to start the tradition this year with my son’s kindergarten teacher and my daughter’s preschool teacher. To order your “Oh the Places You’ll Go!” book, $10.79, click here!